Omaima Azouz is the successful abaya designer and artist behind the brand Fiore. She’s had a very interesting career thus far and had been making a significant mark in the entire fashion industry of Saudi Arabia. Azouz was creative from a very early age. She received a BA in Islamic Arts from King Abdulaziz University in Jeddah and deepened her studies into textiles, fashion, chemistry, raw materials and other subjects related to the larger fashion industry. She then went on to receive a master’s degree in Design and Fashion from the University of the Arts in London. Her attention to detail has always been one of the secrets of her success but there’s also the business side to her work. So after professionalizing her business, Azouz set up a Saudi joint stock company that specializes in designing, manufacturing and marketing fashion. Other highlights of Azzouz’s career include being invited to take part in the Janadriyah National Festival for Heritage and Culture, upon receiving an invitation from the Organizing Committee. As she told Arab News: “This participation, along with several others in and outside the country helped me to make a name for myself. (Through my fashion house) Fiore, I am trying to blend in the Saudi heritage into stylish abayas.” Part of Azzouz’s role at the large festival was to design costumes for the participating stars, inlucding Mohammad Abdo, Abdul Majeed Abdullah, Rashed Al Majid, and Majed Al Mohandes. Shortly thereafter, Azzouz then organized a fashion show in Paris within close proximity to the Eiffel Tower. 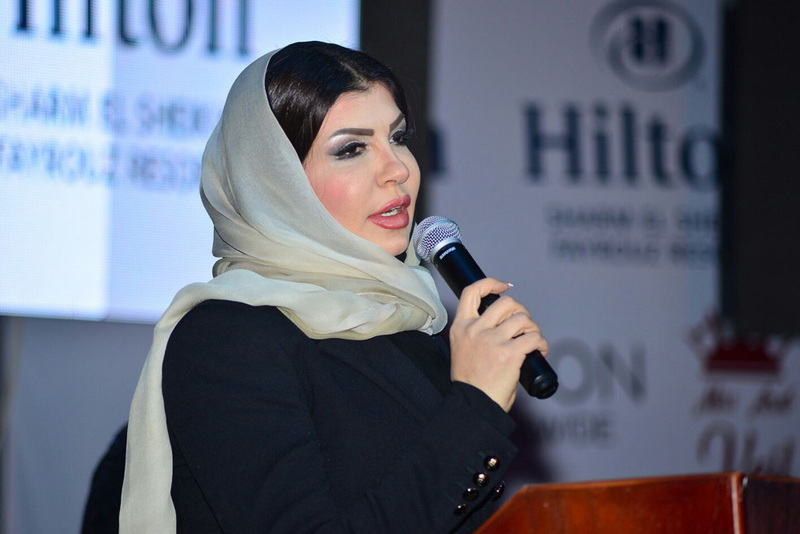 Azzouz says that with the blessing of Sheikh Saleh Kamel, Chairman of the Board, that she was elected as the first chairperson of the Fashion Designers Committee in the Jeddah Chamber of Commerce and industry (JCCI), this committee being the first of its kind, both in the Kingdom, as well as in the region. If it weren’t already crystal clear, Azzouz has ambitious plans for the fashion industry at home and with her creativity and professionalism, along with the support of colleagues and superiors who value her all-encompassing approach, there’s no reason why it won’t work. Some of the key projects that Azzouz plans to undertake include establishing an international fashion academy that will form the bedrock for a homegrown industry. In creating new generations of creative and qualified people to run this lucrative and creative sector, Azzouz is building her vision firmly from the ground up. The second project is building factories in Saudi Arabia that combine all industry-related competencies. These two project will in-turn inform her third goal, which is to establish a permanent market for local fashion designers those seeking to develop the industry. Finally, Azzouz plans to establish 100 national labs for the fashion industry, each with four or five initiatives that will produce specialized fashion lines. The number of Saudi women working in the factories will range from 25–50. In less than three years, Omaima Azouz has gone from one highlight to the next. In this short amount of time, the long list has included overseeing a forum of promotions that was organized in Jeddah in order to discover new, local fashion designers and other creative talents. She has actively supported the participation of Saudi women in Arab and international competitions, the latest of which was the Arab fashion design competition that held in Cairo and included five Saudi women. Under the patronage of HH Sayyida Basma Al Said of the Sultanate of Oman, Azouz participated in the 2017 “Year in Saudi Fashion.” Azouz also chaired the Miss Veil Committee in Sharm el-Sheikh, Egypt and received the award the most creative and innovative designer of 2018 at the Arab Satellite TV Festival. In 2017 Azzouz took part in the largest Arab fashion show in Cairo. She presented her fashion lines along with other leading Arab designers, including famed Egyptian designer Hany El-Behairy, who is the creator of Egypt’s most expensive wedding dress. This event occurred in the presence of numerous celebrities and public figures from the media and politics and was led by First Lady of Egypt and wife of President Abdel Fattah Al Sisi, Nasr Amer, and Sahar Nasr, the Egyptian Minister of International Cooperation. Azzouz was also recently given the honor of being named the Arab Fashion Ambassador in Spain, an honor that was bestowed by the Spanish Minister of Tourism Alvaro Nadal. This occurred in the context of Azzouz being singled out as the best designer in the entire Gulf, following her presentation at the the fashion week in Marbella, Spain, which hosted 1,500 Arab and international personalities, celebrities and lovers of fashion and beauty alike. Omaima Azouz’s creative work and modern designs have made a mark all over the world but regardless wherever her exciting career takes her, there’s always a nod to her Saudi heritage.